« 2018 Fall Raffle Saturday September 22nd! Field Day – Saturday May 19th! 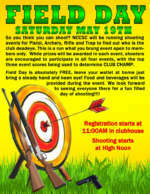 NCCSC will be running shooting events for Pistol, Archery, Rifle and Trap to find out who is the club deadeye. Free members only event, food and beverages will be provided. We look forward to seeing everyone there for a fun filled day of shooting!!!! For more information visit the 2018 Field Day page.